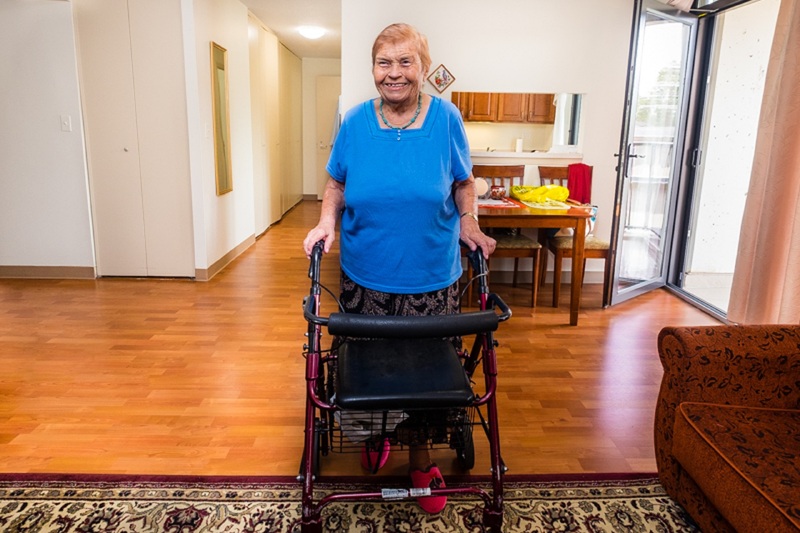 Dec. 2, 2015 – Lauren Gill – It’s giving these seniors a reason to live! A Midwood apartment building for low-income seniors is in the middle of an extreme makeover that will take the 13-story tower from drab to fab — and now elderly residents say they hope their golden years never end. “I want to live longer now,” said Liez Genbom, a 92-year-old Marien-Heim Tower resident who moved to Brooklyn from Ukraine 15 years ago. The building is nearing the final stages of a $14.8 million renovation funded by the federal government that will leave residents in its 182 units — whose ages range from 65 to 102 — with refurbished and updated apartments, including new flooring, kitchens, bathrooms, and landscaping. But the tenants — all of whom qualify for federal rental assistance and only have to pay 30 percent of their income each month — won’t be left footing the bill. The United States Department of Housing and Urban Development funded the work through its Rental Assistance Demonstration program, which allots money for developers to make over public housing buildings while still keeping tenants’ rents low. And workers appear to be content — tower denizens chatted them up and made new friends as the construction went on, according to building administrator Theresa Vacante. “They loved the company and having someone to talk to,” she said of the residents. Residents’ support for the project marks a turnaround from their initial reactions when they found out their apartments would be redone — many of the seniors are long-term tenants who have lived in the tower for years, and they worried the new digs would not be up to snuff with the home they had become accustomed to, Vacante said. Now the tower, which boasts views of the majestic Verrazano-Narrows Bridge, iconic Coney Island, and — unfortunately — New Jersey, is ready to serve new generations of oldsters clamoring to get in. And clamoring they are — Vacante has been working off a 300-person wait list for studio apartments and a 500-person wait list for one-bedrooms since 2007, she said. At least one senior appears to already be taking full advantage of his plush new pad.